Stomp understands that Madam Salinah has succumbed to her injuries. Her husband, Mr Indra posted an update on Facebook at 1.40pm on Thursday (Feb 14). He wrote: "With a heavy heart, I wish to inform that my wife Salinah has left my side to be with our Creator forever at 1150hrs." "On Feb 10 at 9.23pm, the police were alerted to an accident involving a car and a pedestrian at the junction of Maxwell Road and Shenton Way. "The 41-year-old female pedestrian, a police officer who had just reported off from work was unconscious when conveyed to Singapore General Hospital. 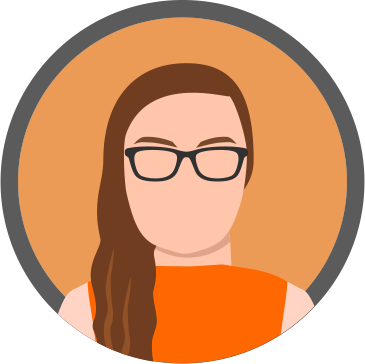 "She subsequently succumbed to her injuries on Feb 14. "The 51-year-old male driver was arrested for dangerous driving. "The police are providing assistance to the officer’s family." A 41-year-old police officer is in a coma after she was hit by a car while crossing the road at the junction of Maxwell Road and Shenton Way on Sunday (Feb 10) at around 9.20pm. Stomper Foo alerted Stomp to the incident and shared a Facebook post appealing for witnesses of the accident. In response to a Stomp media query, the police said Madam Salinah Mohamed, who had just finished work, was unconscious when taken to Singapore General Hospital (SGH). "The 51-year-old male driver was arrested for dangerous driving," a spokesman said. "The police are providing assistance to the officer's family." 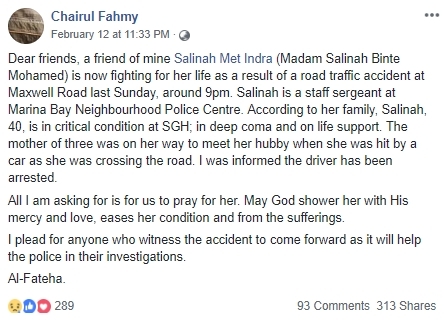 Madam Salinah's husband, Mr Indra Shaiful, 41, told The New Paper he was home with his children when he was told of the accident at around 10pm. Mr Indra was told by doctors that his wife had suffered severe head injuries and was in a deep coma, being supported by a ventilator. He revealed that the couple had intended to go on a short getaway for their 14th wedding anniversary on Feb 28. Due to Madam Salinah's irregular work shifts, they try to find time to spend with each other like taking public transport home or having dinner as a couple. He is also worried for his oldest daughter who is taking her Primary School Leaving Examination this year. "Those are like killer questions for me because I don't have any answers for them. It is hard to comfort them when I myself don't know if my wife will be able to make it." He told TNP that a CT scan would show if his wife was brain dead. "We thought we saw positive signs because her face looked better and her breathing was stronger. But then the doctors told us about the blood flow. It is very sad. When the results come out, I will have to make a decision. "The police have told me they have arrested the driver and that's enough for me. I don't want to know anything more. I just want to focus on my wife."